Income Society Review: I Greatly Underestimated it! Name: Income Society by Adeel Chowdhry. Price: $9.95. After purchase you have 2 up-sells, one of which sent me mixed messages. I didn’t purchase either of them but they are both $37 and if you decline, you’ll get 1 chance to buy each of them for $27. Then if you decline that, you can still purchase it from the members area. Overall Rating: 5 out of 10 stars (I apologize for Adeel because I felt the program was a scam until I actually entered the members area and saw just how much information there really was). A basic and VERY detailed program on affiliate marketing from the absolute beginning stages and it’s extremely newbie friendly with the way it’s designed. There are 22 learning modules within the members area which go over everything you need to have set up to run a website, promote products and most importantly make money online. 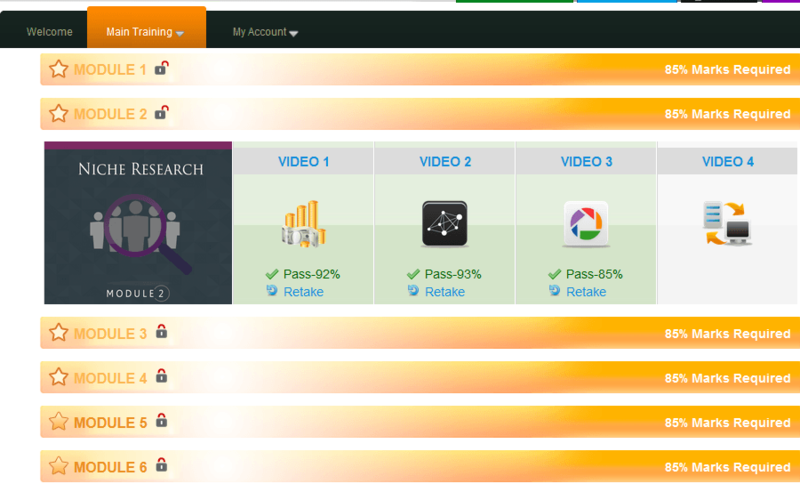 Each module has a video or series of videos detailing each topic and stage of the online marketing process. In addition there are also PDF downloads available and the ability to view each lesson (module) in text. What is another interesting addition to these lessons is that there is a test that is mandatory to take after you’ve completed a module. If you don’t complete it or at least get an 85% score, you will not be able to advance into the next module/s. I rarely have a positive experience with products I purchase from JVZoo. There are many programs and training guides on making money online, but most of them offer very little in terms of information, not much practicality and in many cases are just there to give you little information while providing other parts in other programs which you have to buy. Alex Jeffreys (Digital Millionaire Mastermind) and Joshua Zamora are perfect examples. Alex offers more hype than promise than Joshua is someone who keeps making one product after another, hyping it and then moving onto the next one. Some of the programs these 2 gentlemen deliver do work, but overall, I have never rated it high and this is common for the other programs I review from there. I hate up-sells. And because Income Society was only $9.95, I absolutely knew I was going to see them. The first one was mentioned as being free by Adeel, but it says right underneath it’s $37. What gives? A second up-sell followed this one where it said I would be provided with a lot of training material on SEO and other topics (33 training lessons I think) and a number of interview videos. This one wasn’t confusing but just in case you were wondering about what you’re getting, now you know. So up until that point, I didn’t have a high opinion of Income Society and expected the members area to follow alongside the same path. After all, what could $9,95 possibly provide me with, especially since I’ve already seen the same formula used and saw what it led to with similar programs I’ve purchased on JVZoo before. 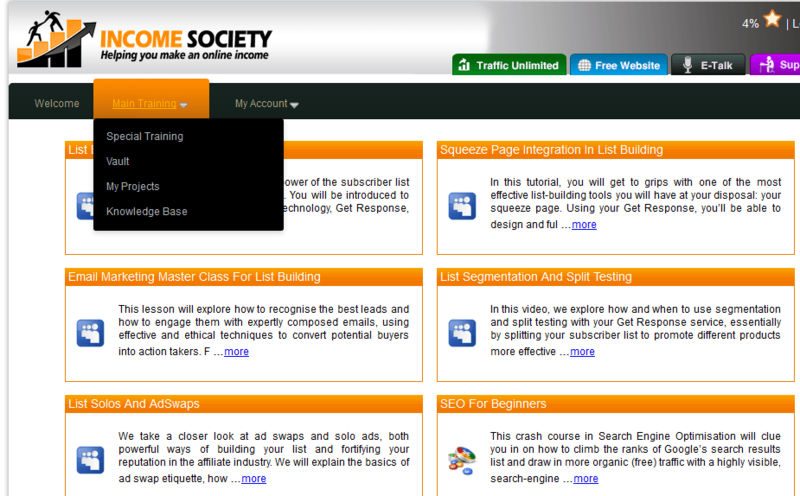 What you’re seeing in the image above is the special training area where you learn about email marketing and SEO. In addition there are also guides on Solo ads and topics related to that. Then we have vault which has 25 tutorials on small things related to YouTube, making links on your WordPress site and a number of other very micro oriented topics which deal with marketing and web design. My projects is basically a notepad where you take notes on anything you want. It could be what you learned from the training modules to ideas you have in mind. It’s really irrelevant to have it since you can use your own notepad or other document programs, but it keeps it all in one place so it may be convenient for some. Knowledge base is really just an F.A.Q section of the site. Notice the locks in modules 1 and 2. They are “unlocked” while in modules 3 and ascending are locked. As I mentioned to get them open, you need to take tests which if you notice I am doing in module 2. The scores aren’t 100% because I tried skimming through the tests without looking at the training associated with it and some of the training, while very similar to what I personally know about this business has certain parts which are different and in my opinion outdated so some answers I gave weren’t correct. For example, they talk about Market Samurai which is a keyword tool they recommend for niche research. I don’t like that tool and prefer a better one like Jaaxy and other things such as competition numbers for keywords are also talked about in a method which isn’t familiar to me. There is a lot of material to go through with this program. The price of $9.95 is really, really good for what you get. A number of other highly informative tutorials and topics are discussed in great detail. Training is covered in multiple formats (video/text/PDF). There are parts of the training which I found a bit outdated or not to my personal taste. I don’t really like the need to take a test to open up the next stage of training. It’s annoying to me, but it does ensure people know the topics before they move forward which DOES have a positive impact on learning and thus succeeding so this may serve as a pro. Lack of social interaction on the members area. I may be asking for a lot but I feel if there was a community of people who would help one another in Income Society, it was REALLY improve the program’s overall success. Right now it feels like a lot of information is there for you to adsorb and if you have questions just email us. It’s good, but programs like Wealthy Affiliate offer everything and more than Income Society, PLUS the community aspect of speaking with other members anytime. That’s what I would love to see with this program too. 5 out of 10 stars. I expected bad things, but was surprised and happy to be wrong. This program does work. This is a good place to start if you’re just beginning online. I would only focus on the modules before heading into the rest of the training, otherwise you may get confused or lost. As for the up-sells, I’d only focus on the main training before expanding outward to the other offers. The Dirty Secrets About Empower Network Sponsors. You are bound to encounter a lot of people promoting Empower Network. These people are called sponsors and in many cases, you need to watch out for them. These are people who try to get you to join the network through them. In exchange they promise to help you make money in this business. But there must be a catch right? Why would anyone want to help you make money online unless they had some stake in it too? There just happens to be one. Enter the dirty secrets about these sponsors and what you need to know if you’re considering joining Empower Network. Before I go any further, I want to point out that I am one of Empower Network’s biggest critics. I find this organization to be nothing short of a scam. The biggest reason you’re being pushed into this program by a sponsor is because they make 100% commissions of you joining the organization. That is the biggest reason you’ll find them so “helpful” and “friendly” towards you. The $25 doesn’t actually get you anything. Just a worthless blog, but now begin the crazy up-sells of Empower Network where you are basically told by your sponsor to buy higher level memberships as well as all the other services this place has to offer to the grand tune of $5,000+. This is what they call going “all in”. You would think this is something no one would ever do, but here’s the kicker: The rules of this organization are that if you want to make commissions, especially the big ones, you first have to buy the high cost products (which is nothing more than video training) first to be allowed to promote it. The real issue here is that most people feel that they can refer several people into this organization, break even and even make a lot of money and so many of them do it. I’ve heard horror stories of people plucking down their last savings into this and not seeing results. Read Empower Network complaints here. 1. The nice guys. The ones you see blogging about how great Empower Network is and saying they’ll help you make a ton of money through their awesome training. Guys like Rob Fore, Vick Strizheus (a scam artist & one of EN’s top earners) and others. He recently created a new program called Four Percent Challenge. While I can’t claim that they are as caring in reality as they make it seem through their blogs, do take the soft approach and make it sound as though they have tons of people trying to join through them who absolutely adore them and will help them make money in this business. I can’t attest to this being true, but this is what they make it seem like (although experience has taught me most of these people are full of you know what). Some of them are claiming that they are the top sponsor to Empower Network & promise to teach you secret and amazing ways to rank your website/s high and get sales. But the price which you’ll pay for this is not worth it! And these “secrets” are nothing more than basic SEO methods. Let me spare you their nonesense and just reveal what really works: Here it is. 2. The ones who are nice when convincing you to buy, but then flat out ignore you once you do. I hear this very often with affiliates who promote this program to others. They only really care about selling you the product, then once you do, they are gone, leaving you hanging and figuring out how to make back on your investment. 3. The ones who are nice when you join, but then bully you into going “all in”: These are the worst. I mean literally the lowest form of sponsors you could ever encounter. There are many people like this (not everyone!) who promote this network to you and if you join, they literally call you names and belittle you unless you “Go all in”. The program is disingenuous to begin with. From the very start you are seduced into the $25 offer, only to find out this gets you nothing and to get anything out of this place, you need to invest even more money ($1,000’s). And if you do get all of this, you will be taught nothing more than how to promote the same scam to others. This is absolutely unethical and wrong. My advice to you is to think long and hard about this place if you’re seriously considering joining it. Check out my full review of Empower Network to fully understand just how deep the rabbit hole goes with this program. Remember what I said about less than 1% of all it’s affiliates making any money. It’s true. Here is the proof I promised. Not to mention if you’re ethical to begin with, why would you want to involve yourself with this? If you have a story to share about Empower Network or a sponsor you know, I’d love to hear about it. Please comment below. 5 Ways to Get Indexed in Google Faster. There are many ways to get indexed in Google faster, but many of these methods are dangerous for your site’s reputation. This post however will show you the 5 safe ways to make this happen. It’s easy, anyone can do it and it will definitely help your site’s traffic and index speed! Method #1: Make a site map of your blog and add it to Google Webmaster Tools. Step 1: Sign up with Webmaster tools. Add your site’s URL and verify your account (Webmaster tools gives you 4 ways to do this). Step 2: Go to your blog, then plug-ins and type in “Google XML sitemaps” and pick the one created by Arne Bachold, install it, then activate it. Step 3: Then in your WordPress administrator area, settings and scroll down to the bottom. The page “XML sitemaps” should appear. Click on it. Step 5: Head back to webmaster tools, click on your site there (you should have it verified by now) and then select “Sitemaps” to the very right of the screen. This will take you to a window where you can submit your site map. Step 6: Simply type into the window: sitemap.xml (your website will already be there so all you have to do is enter the site map add on). Benefits: All your pages on your site will get get indexed within Google. This will help exposure and indexing. Making a YouTube video and linking it to your site or a specific page on your site greatly helps exposure as well. This method is not for everyone, especially shy people, but it really helps with indexing as YouTube videos have a huge page rank privileged with Google, meaning if you create a video, it will likely get ranked high in the search engines, attract traffic and funnel to your site. Method 3: Utilize social networks for traffic + comments! Become a member of at least 2 of the above places and whenever you create a new post/page on your site, provide a link to the above places for people to visit. It’s likely many of our reading this now already have Facebook accounts. You should use this and link your friends to your website to leave comments and likes. These tips also help with comments. Encourage positive feedback and leaving helpful comments that can create a discussion. Don’t just have them say “I like your site!” This is boring and stale. As more and more people come to your site, seeing comments will make them more likely to do the same and this will lead to better rankings. Also: Add the plug-in “Tweet, Like, Google+ & Share”. This will add a “like button” to all of the pages/posts so people can go there and click on it. The more likes/comments you have on your pages/posts, the better indexing and ranking your site will have. Method 4: Find low competition keywords and write posts/pages on them in your website. Keywords are not all the same. But there are many that get a lot of searches and have little competition which you can capitalize on. How do you find them? Well here is a full tutorial on this, but it all boils down to using your imagination and thinking what people would type in search engines in order to find what you have to offer them. Method #5: Add fresh quality content several days each week! This method is actually related to #4, because a lot of the content you’ll be writing about will come from looking up keywords and writing about them. Make sure to add fresh new pages/posts to your website several times a week. I have some sites which I do this for on a semi-daily basis. What I personally do is either pick a keyword which is also a good question or topic (hint: the subject of this post!) and write all about it. You need to provide readers with quality stuff to look at. There’s no point in sending people to your site and try to sell them something. That’s bad SEO, that’s bad for your visitors. They won’t stay, they won’t leave comments and this will hurt your rankings in Google. Instead offer them something they can use and truly keep the reader in mind when writing up your content. Think of them first before selling anything. All of these steps will help get you faster rankings in Google. Utilize them all if possible! There is no real wrong way of doing it. Avoid at all costs using ANY black hat services like backlink packages or SEO companies. Here’s why. Their methods of helping your site get indexed faster will only hurt you in the long run because their tactics are frowned upon by Google and if you’re discovered using them, your site will lose all of it’s rankings! Bonus method: The Fetch as Google option! In order to do this, you MUST have method 1 down. If you do, simply head to webmaster tools, visit your site you’ve added there, then click it. Look over the left hand menus, click crawl, then several options will open up, one of which will be titled “fetch as Google”. Click it. A page will open up with your website URL, a forward slash (/) and a blank box next to it. What you need to do is add the permalink of the page or post you wish to have instantly indexed and add it there. In the blank box of the fetch as Google option, the “about-me” (without the quotes) is what you want to paste. Then click fetch (there’s another option there, but fetch is fine on it’s own to click). This will instantly index that specific page. And for every new page and post you write up, you can utilize the amazing option. Do I recommend you do it all the time? Not really, but for new pages who typically take longer to see indexing happen, this can certainly cut down on time and help faster rankings happen and you can use 500 of them every month I believe. How Long Does it Take to Rank in Google? How to Speed it up. The short answer is, several weeks to a few months. For most website’s, this is the general stat for how long it takes to get ranked in Google. But this is not always guaranteed because there are 4 major factors really which affect the speed in which this happens. Sometimes one of those factors can be the most important for rankings, and other times, it could be multiple ones (even all 4). 1. Your website platform. If you are using a basic HTML site, it will take longer to rank in Google. Stick to using WordPress for your site as it will not only make the process of making site’s and pages easier for you, but also help with Google’s spiders noticing your site faster. WordPress has a built in function which updates Google each time you publish a new page/post on your site. 2. The quality and quantity of content you have on your website. What is content? Content is anything you put on your website. It could be an informative post/blog that provides valuable information to readers. Here are good examples of what you want to be writing. Quality content is absolutely necessary when trying to rank high in Google. The better quality content you have, the more likely readers will stay and leave comments on your website which will greatly help in the process of ranking. Also quantity content is also important. You should aim to add new posts/pages to your website on a regular basis. On some sites I do this almost daily, other times semi-daily. If Google sees your site and notices fresh new content each time, they will reward you for this. Note this website. If you check back every few days, you’ll notice fresh new blog posts. This is something you should also aim to do with your website. 3. The keywords you are chasing. Not every keyword is the same. Most people always try to chase keywords that get a lot of traffic, but unfortunately most of these keywords also have A LOT of competition surrounding them. New websites are going to have a very hard time ranking under competitive keywords, so your best bet when starting is to chase low competition keywords with preferably a lot of traffic and even just a little. Some traffic is better than none! Use this tutorial on how to find profitable keywords. It’ll help you find good keywords as well as their competition. 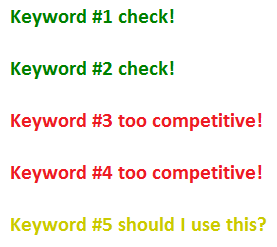 Use a keyword tool. Keyword tools tell you estimates and even accurate data on how many people search certain keywords and how much competition they have instantly. There are a large # of these tools available, but I prefer this one above all else. You can actually try it for free. Factor 4: Your website’s authority with Google. This one is HUGE. The more authority your website has, the faster your pages, both old and new will show up on Google. I’ve seen blog posts rank within hours after being published and this was only because my website developed authority with Google and this kind of thing takes time. The process of attaining authority with Google really depends on the quality of content of your website (how to get an authority blog). Freshly built sites will not get this preferential treatment, but through time and writing up valuable content, their page’s position will slowly rise and eventually get to a point where new posts will rank instantly. In the end this is really a race where the turtle will always win. But there also a couple of methods I recommend which can help speed up the process. Here are 5. When your browse Google and find your site anywhere on it, for the first time, that can certainly be an exciting feeling, BUT the position of that page is VERY important to gauge. Is it on the first page? Is it on the second or lower? Odds are, for most people, it’ll be on the second page and further down, which still is still considered to be a rank, but unless it’s on the first page, you’re missing out on the bulk of potential traffic, so I wanted to re-iterate how important the SECOND factor is out of the 4 above because that will ultimately be the most important factor for making those pages be on the first page and that will be the defining factor in whether or not your site will be successful in the traffic department. And to reach that, again, REALLY focus on factor 2. I cannot stress how big of a deal this is in the long run for your site to grow, become successful and make money. I have run a lot of blogs, many have failed, and many have succeed. The ones which succeed were those that hit a lot of page 1 positions in multiple keyword terms, but the ones which made it to that spot were the ones where I really put a lot of focus in factor 2, in that I sat down and wrote, as much as I could for the site/s in question. While having the kind of quantity in content needed to have those positions is VERY tough and most people simply will NOT have the patience to get there, it is the only realistic way of ranking (HIGHLY) in Google and that is the most realistic way of that site to being successful. It is WELL worth the effort though as once you make it there, it’s not difficult to keep those positions up and from that point, your site will have a VERY good standing with Google (authority) so any new content you write up will already be given much more privledge and high positions than it was before. So in other words, making the most out of factor 2, will help you get to factor 4, the authority stage and that will REALLY carry your site to long term success. And there is no better way of securing your page to succeed in SEO than this way! Bring The Fresh’s SEO Course Overview. It’s Useless Today. As a former full disclosure member of Bring the Fresh, I’d like to share some insights on the SEO course this place will takes you through. The entire Bring The Fresh “course” consists of just the “Fast Start Guide”, that’s all. This is where the bulk (99%) of all your SEO training will come from. The fast start guide is a PDF that’s updated every few months by Kelly Felix and available to be downloaded by all members. 2. Market Samurai, another keyword tool which then further analyzes the keywords you found using the first tool and narrows down if the keyword/s you chose are worth perusing. Once you find a keyword, the next step is trying to find a domain name for that keyword. Kelly recommends buying the exact domain name of the keyword you wish to rank under as he claims this makes it easier. From my personal experience, this is true. Once this step is done, then begins the technical stuff, about 30 pages of it where you set up a WordPress platform for your page and then make it “SEO friendly” by installing certain plug-ins like Platinum SEO and pretty links. The last part of the course is all about setting up your website/s pages and posts so that it starts to get ranked in Google. This includes adding YouTube videos which the guide recommends you make yourself as it improves your page’s rank in the SERPS as well as utilizing BTF’s services such as “The backlink packages”. Speaking from experience, I would NOT recommend using any of these packages because I’ve had very bad experiences with them which led to a dispute between myself and BTF, that later ended up making them suspend my membership, hence my “former” full disclosure title in the beginning of this post. The only real course in this site is the fast start guide, the rest is either the forum or upsells which there are many of in BTF. Though many of the tactics the fast start guide teaches do work, there are also many tactics (such as the backlink) packages which do not. 1. Read my BTF review. It’s completely un bias and you’ll be shocked at what you find out. 2. If you’re looking for great SEO training, I recommend trying my #1 recommendation. This place will provide you with the most up to date training and very few up sells. Does anything that the Fast Start Guide teach still work? Years later, after I had my whole scuffle with BTF (and forgotten about it), while going through an old list of PDF guides I had accumulated on online marketing training, the fast start guide came up again and I decided to skim through it to see if what it originally taught was still applicable. To be honest, if I were to take it’s original date when it was made (2012 I think) and the SEO rules that existed back then, I would say this guide gets you about 10% on the way to success there. Today, in 2018, I would say it gets you about 1% of the way there and that’s because the entire set up it goes through it really just setting up a WordPress site and editing some SEO settings. 6 years ago, this would have actually gotten you SOMETHING in SEO, such as potentially a decent ranking for some keyword, but today, you’ll probably get just a Google index out of it and no real ranking. Kelly’s advice on SEO was OK at one point, but I think he got very greedy with his high ticket backlink packages, which as I said I fell for. I think this focus on just trying to sell high ticket stuff, that I already said ends up destroying SEO is ultimately what led to the crash of BTF. If BTF was the way it originally was, not only would it still be around, but I would probably still be recommending it. Now it’s gone, but don’t worry, here’s 5 other options for programs like it, with Wealthy Affiliate being at the top of that list of 5.